Decidedly not a pleasant subject, but if you’re indeed a pet owner, it’s one of the realities of pet ownership in which knowledge really, truly is power. So let’s begin by dispelling the myth that Ringworm in pets and in humans involves squiggly little worms crawling on your beloved Bludo’s body... nope, not even close to the truth. Feelin’ a bit relieved, are ya? Yeah, well not so fast! While no icky worms are involved, Ringworm is a skin infection caused by fungi called dermatophytes, which means, "plants that live on the skin". The name came about because the marks caused on human skin are red and circular, appearing a little like a ring formed by a worm (and "Ringfungus" doesn’t quite seem right, does it?). Ringworm infections can appear on dogs, humans, cats… even bunnies and guinea pigs can be susceptible. All pets can pick up the infection from the environment, as the spores of these fungi are extremely hardy and can survive for years (Mother Nature can be so fun!). Pets with scratches or irritations (or those that have recently been shaved and may have been knicked or mildly irritated in some way by the clippers) do not benefit from the full, protective armor that healthy skin provides, making them more susceptible to infection. 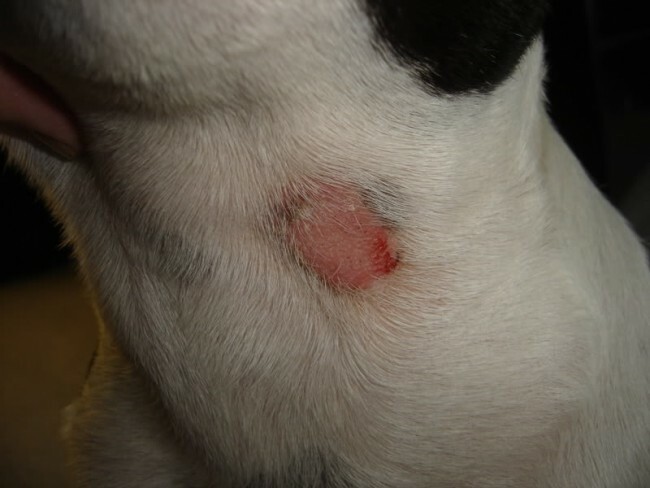 It's important to understand that Ringworm does not infect healthy skin and needs to gain entry through an area of skin that has been compromised in some way. The spore-covered hairs that fall from infected pets into the surrounding environment are precisely how the condition can spread among pets in the same household. And while humans certainly can contract Ringworm from their infected pets, people with sturdy immune systems are less likely to be affected. Therefore, young and old people, and those with chronic illness or stress, who might have a cut or a knick in their skin and come in to contact with an infected pet are groups that are more likely to become infected due to their weaker immune systems. Now, if you see a peculiar lesion on your pet and you suspect a possible Ringworm infection, don’t panic… really, don’t. However, DO consult your vet. A positive diagnoses of the fungal infection can be been made after looking at it under a "Wood's Lamp" (a special UV light), but a culture of the fungus may still be required to absolutely confirm the diagnosis. So, your pet has ringworm. What now? Dippity Do: Your pet will probably be prescribed a combination of dips or washes, and possibly either oral tablets or liquid. In some cases, topical creams and washes may be enough for treatment. Isolation: Your little infected, petri-dish pet needs to be isolated until clear of the condition and the areas in which he is kept need to be thoroughly disinfected afterwards. Of course, don’t forget about yourself and do seek medical advice if you suspect you may have contracted the infection too. But try not to worry too, too much! While Ringworm is certainly annoying and tedious to treat, it’s not at all life threatening and can be very safely cured... with commitment! Previous topic Preparing Cats for A Baby! Next topic What Is Ehrlichiosis?